Spacious, two-storey safari tent with all your home comforts under one roof. 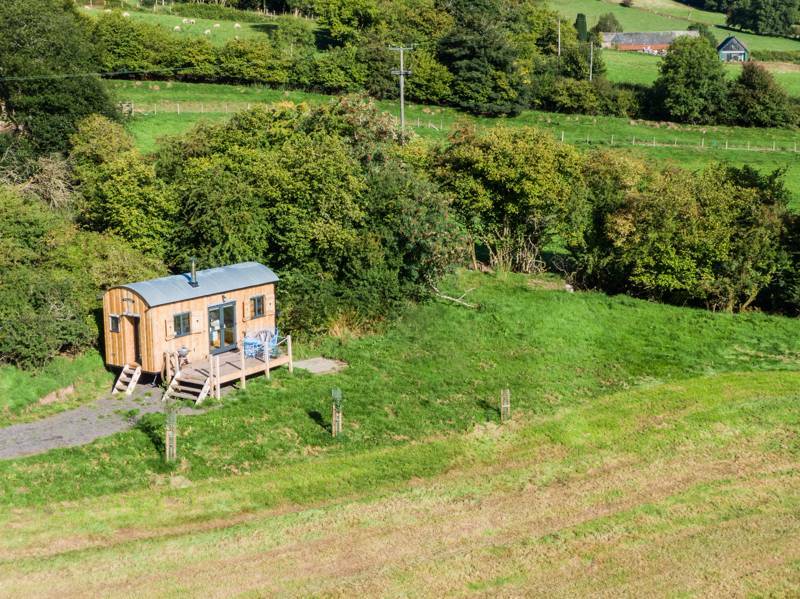 The panoramic views over Llandeilo town and the beautiful Tywi valley will take your breath away! 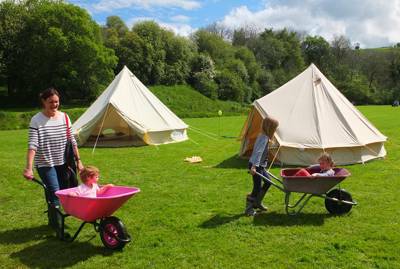 Gelli Glamping seeks to share with you the very best of Wales. You will be greeted by your Welsh speaking hosts Carys and Rhodri, who may teach you a little of the oldest British language if you're interested! A locally sourced hamper of Welsh goods will be waiting for you in the tent, and our hens will be happy to provide eggs for you every day if you wish! But what makes this site extremely special is the view over the Tywi Valley, and the huge variety of experiences you can enjoy. 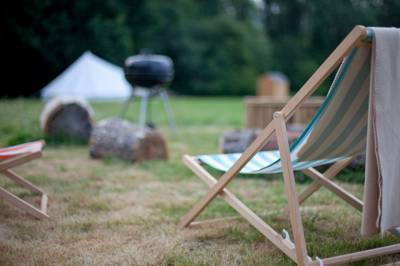 For latest availability and best prices for Gelli Glamping, please use the Date Search above. En suite shower room, toilet and wash basin. The tent kitchen has a microwave, toaster, fridge-freezer and four-ring gas stove. It has an electricity supply with plenty of lighting and plug sockets too. There’s a log-burning stove inside and a fire pit outside for campfires. Logs are provided. You can see deer grazing and, if you’re lucky, hares hopping by from the veranda of your safari tent and (if you’ve got your hiking boots) can set straight out on walks on footpaths that pass right by. There’s horseriding nearby at Dinefwr Riding Centre (01269 850042) and mountain biking at Brechfa Forest, about 20 miles away. The nearest town is Llandeilo, a couple of miles away, where you’ll find independent shops, places to eat and a picturesque setting. 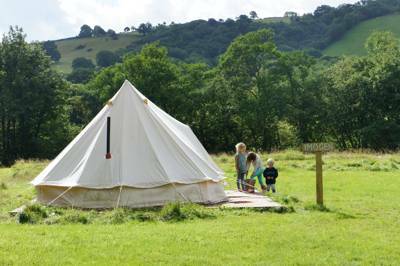 You can walk to both Carreg Cennen Castle, 3 miles away (01558 822291) and Dinefwr Castle, which is just half-a-mile from your tent. The castle at Dinefwr is part of an 800-acre estate owned by the National Trust which also includes a deer park, national nature reserve and 17th-century Newton House. The ruins of another castle, Dryslwyn, are a short drive away (7 miles) and Gelli Aur Country Park, 5 miles, has a tearoom and walks in the estate surrounding a mansion (not open to the public). There are beautiful gardens and another historic building at Aberglasney (01558 668998) 7 miles from Ty Gelli. The National Botanic Garden of Wales is a little further, 10 miles away, at Llanarthne (01558 667149). Within its grounds is the British Birds of Prey Centre (07444 177818) - buy a combined Garden Plus Ticket to visit both. The Dolaucothi Gold Mines (01558 650177) are 15 miles away. It’s downhill on the way to The Cennen Arms pub (01558 822330), about ½ mile away in the village of Trap, where you can fuel up on basic pub grub for the steep walk back. But for a highly-recommended bite to eat, get in the car and head instead for Wright’s Food Emporium (01558 668929) in Llanarthne or for one of the many eateries in nearby Llandeilo. Among the options, there’s Ginhaus Deli (01558 823030), The Cawdor Hotel (01558 823500), The Angel Pub and Capel Bach Bistro (01558 822765). The town also has plenty of places to pick up supplies for picnics and campfire suppers with a farmers’ market every Friday morning and a choice of local butchers and delicatessens. From the end of the M4, heading west, carry on along the dual carriageway towards Cross Hands. At the next roundabout take the fourth exit signposted Llandeilo. Stay on this road for approximately 8 miles to Ffairfach. Go straight over the mini roundabout and under the railway bridge, then take an almost immediate right towards Trap (sometimes spelled with two Ps). Continue for just over a mile to the top of the hill where you’ll reach a crossroads. Turn left at the junction and take the second turn on the left (about 500 metres down the road). Ffairfach railway station is 2 miles away and Llandeilo train station is 3 miles away – a short taxi journey or (for those in the area for the cycling) a challenging bike ride away. A single private safari tent (sleeping 7).